The clocks have gone back, darkness is settling in but thankfully the beat of the drum still resonates on Buchannan Street. Coming out of Buchannan Galleries rhythmic pulses are heard instantly. My youngest son and I search for the source until we find the drummer. It’s good music and we get a wave and a smile when we drop some money in his hat. But I can tell from the look on my son’s face, that this is not the busker he’s looking for. And so we’re off again. The backdrop of buskers in the city centre of Glasgow is second nature – different music and noises mingling with the soundscape of the city. From religious fervour to wee boys with oversized guitars, football skills to dodgy rapping, Glasgow is witness to it all. 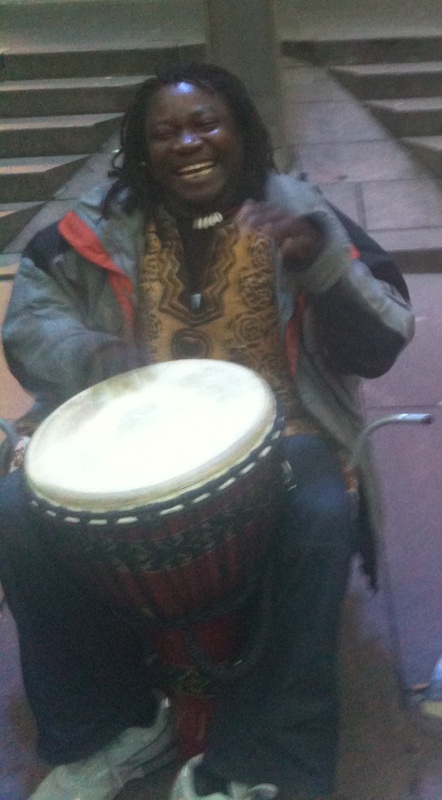 But we’re like anyone, we have our favourite – an African drummer with the widest smile and sparkling eyes. And today my son is determined to find him so we wander further down Buchannan Street. A new drumbeat emerges and my son finally spots him. And then the magic begins. Because, this isn’t just a guy beating a drum – this is an interactive artist offering you the chance to become part of the music! And that’s exactly what my son does – he tells the drummer his name and intern the drummer sings it back to him echoing each syllable with a rhythmic thump. My son is thrilled with his new found fame. As we walk further along, the African rhythm merges into the energy and passion of the Tartan clad drummers and bagpipes cutting across all other sounds. This fiery group of musicians channel Scottish identity and pride – and they’re inviting all of us to join in the celebration. And so we do. Admittedly as we move towards the end of the street, buskers take on a distinctly more commercial, refined feel. A man and women with a guitar and microphone sing a song I recognise yet can’t name. It will no doubt be in my head for days. These are of course only some of the buskers you’ll see. But one short walk down Buchannan Street has taken us from Africa to Scotland, from passion to refinement. So this weekend go out and see a busker or two, give them a nod – or even spare a bit of change – at the very least thank them for creating a fantastic backdrop of colourful, uplifting music on these darkening and cold days. 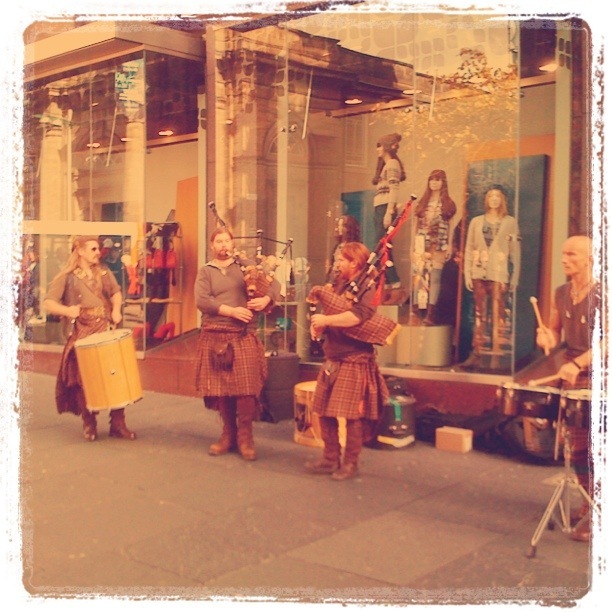 This entry was posted in Glasgow and tagged Buskers, Drummer, Glasgow Buskers. Bookmark the permalink.